Hmm...I love Fridays :) I love Fridays with double hearts!!!! Wanna know something else that I love with double hearts? Butterflies!!! Oh how they make my heart flutter...get it? Tee hee ;) Here is a Happy Friday card for all of my online friends to share and enjoy! 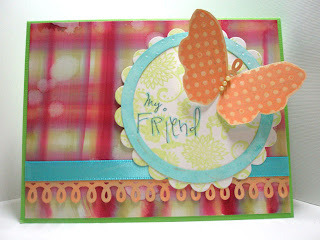 This is so bright and cheery--love it! This is gorgeous girl!!! I love butterflies too :) Fun, cheery card that just makes me happy!!! LOVE it Pryn!! It is just gorgeous! Your background is stunning as is that butterfly that I LOVE!!! Oh how I love butterflies!! PRYN this is SUPER cute! I want that border punch!